Pireta is an e-textile start-up business that has been spun out of the National Physical Laboratory (NPL), a world-renowned scientific research establishment based in the UK. Pireta was formed in 2017, with an initial investment from a seed fund backed by the UK government. The company received further investment in 2018 from private investors. We have recruited a team of scientists and engineers that will take the technology to production readiness. In July 2018, I was recruited as Chief Commercial Officer to drive the commercial activities of the business. What made Pireta want to focus on adding conductivity into textiles? How did the idea come up, and how did the relevant people get involved? The original research work that gave rise to our technology was carried out by a team at NPL led by Chris Hunt, Pireta’s CTO and founder. That team was carrying out research into interconnect technologies for electronic systems. Chris recognized the limitations of existing interconnect technologies for e-textiles and saw the opportunity to apply a novel chemical process in order to add conductive patterns to fabrics. NPL identified the commercial potential of the invention and, after applying for patent protection, a new business was set up to continue the development of the technology and take it to market. What is the challenge that Pireta’s technology addresses? How does Pireta’s technology work and why is it different? 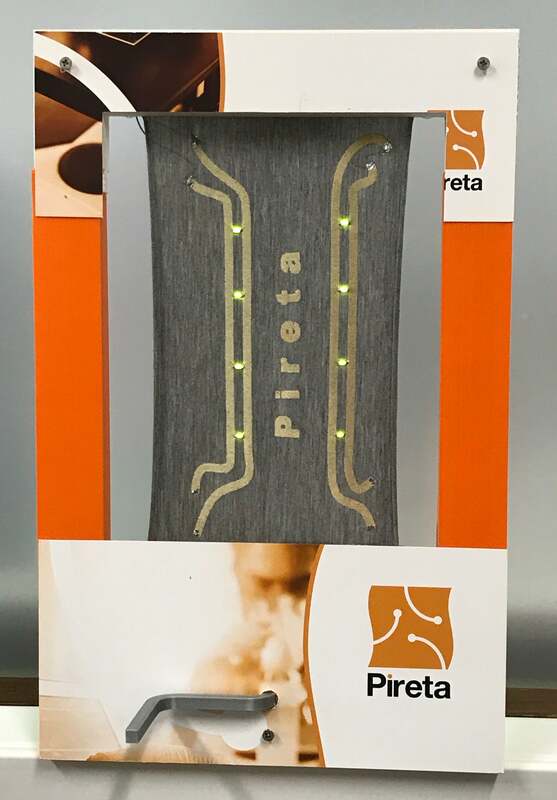 Pireta’s technology uses an innovative chemical process to add electrical conductivity to areas of fabric. The process, which incorporates a printed step, is free form and selective – almost any conductive pattern can be printed directly onto an existing textile. Our technology allows electronic systems to be assembled directly on fabrics, enabling a new generation of truly wearable smart garments and e-textiles. The conductivity is provided by a very thin metallic coating that is chemically bonded to the fibers in the fabric. Typically, fabrics are knitted or woven from yarns or threads that have been created by spinning together a bundle of fibers. Pireta’s process is applied at the fiber level, coating the individual fibers with a layer of copper that is only a few microns thick. As a result, the fibers retain their ability to deform and move, avoiding any impact on the handle, drape, breath-ability or stretch-ability of the fabric. The process adds negligible weight to the textile and allows conductivity to be added discretely, only where needed. Previously, two main technologies have been used for interconnecting electronic systems within e-textiles: conductive yarns and printed conductive inks. These technologies involve adding foreign items to the textile that interfere significantly with the native properties of the fabric. Rather than adding a separate conductive substrate or additional threads to the fabric, Pireta’s process makes the textile itself conductive. The process is based on straightforward aqueous chemistry, utilizing commercially available equipment, and involves five key steps. The first step is to pre-treat the textile, conditioning it so that it is ready to be activated, which is achieved by applying a chemical linker to the fabric. A nanometal catalyst is then jet printed onto the fabric, functionalising the relevant areas of the textile or garment. The next step is to develop the functionality, which is done through an electroless plating process. The very last step in the Pireta process is to passivate the conductive patterns by adding a protective layer that prevents oxidation. This layer can also provide electrical isolation, on a selective basis, where needed. What are the advantages of Pireta’s technology? Comfort. Our technology has no impact on the native performance of the fabric. Smart garments produced using Pireta’s technology will be comfortable, breathable, and stretchable. This makes them truly wearable. Durability: Our technology results in a strong bond between the metallic coating and the fibres of the textile. As a result, our conductive patterns are mechanically robust and highly durable – they won’t crack when the material is stretched, retaining their conductivity. Smart garments created using our process will retain functionality for over 100 wash cycles. Flexibility: Our technology can be added discretely to almost any textile, causing minimum impact and allowing full flexibility in design. Conductive tracks are added only where needed – and the process adds negligible weight. Compatibility: The process can be applied to a wide range of knitted, woven, nonwoven, natural, synthetic, glass, and mineral-based yarns and textiles. Additionally, our technology is compatible with standard equipment and processes already in use for textile, garment, and electronic product manufacturing. Scalability: Pireta’s process is highly scalable and can be operated roll-to-roll at a textile mill or applied later in the manufacturing process to either cut fabric or finished garments. Economical: Our process is additive, and uses commercially available equipment, and involves low cost materials, making our technology extremely economic. Where do you see Pireta being in the next 5 years? In the next 10 years? Are there any future projects in discussion that you can talk about? It is difficult to make predictions that far in advance. However, I anticipate our process at Pireta being used widely in the production of e-textiles and smart garments and for us to have some role in operating the process using our own manufacturing facilities. In addition, we are expecting to license our technology to a number of high-volume manufacturing partners. Pireta will, of course, continue to develop and enhance our technology and process. Our goal is for Pireta to become synonymous with e-textiles and intelligent garments. We are currently working with prospective customers across a range of sectors and application areas – including fitness, wellness and elite sports. Some of the applications are very interesting and exciting. We want to build a thriving, successful and profitable business. To achieve this, I think we will have had a pivotal role in bringing about a major technological shift towards truly wearable smart garments that genuinely improve health, fitness and life in general. Ian has over 20 years of experience managing early-stage business ventures working in high-technology sectors that include wearables, wireless communications, digital media and software development. During this time, Ian has built and managed international development, sales and service organizations. He has negotiated multi-million-dollar technology licensing contracts and strategic alliances with key vendors and partners. Ian has also led three successful trade sales of early-stage technology-based businesses to publicly listed companies.